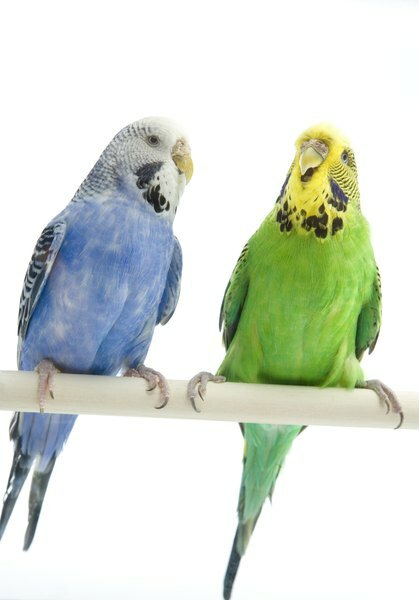 Budgies are extremely social little parrots, and need companionship. As playful, intelligent and inquisitive little beings, budgies want to be part of the family, and entertainment is the name of the game for these guys. They'll be more than happy to entertain you, and will thoroughly enjoy the things you do to return the favor. Set up your budgie's cage with toys such as bells, mirrors and ladders. They'll get hours of fun out of being able to look at and talk to themselves in the mirrors, while the bells and other items will give them stimulating fun and exercise. Watching your budgie play will also prove to be quite entertaining for you, but it's more fun for both of you if you join in the play. Hand-tame your budgie so that he will be comfortable being out and about the home while you are there. A hand-tamed budgie is easier to catch if necessary, and also is more apt to hang out with you while you're going about your daily routine. Hand-taming is not always an easy task, but will definitely pay off. Getting your budgie hand-tamed requires patiently spending time getting your budgie used to you and your hands. Feed your budgie treats, and play games with the treats. Have your budgie fly or walk to you to get a treat, hide treats in easy-to-access places such as a slightly closed fist, or place treats in your birdie's favorite places outside of the cage. Spend as much time as possible with your budgie while you're at home. For some people, this means having their budgie ride on their shoulder while they're at home, or allowing him to fly freely; for others, separate cages in various rooms of the house allow them to keep the budgie close by and protected. Talk to your budgie, and try to do activities where you can be close to him. Having the budgie's cage in an area close to where you spend a lot of time is one key to entertainment; put the cage beside your favorite spot on the couch or near your computer in your office for close interaction while you're at home. Adopt a second budgie as a companion for your budgie, particularly if you do not have a lot of free time to spend at home entertaining your little buddy. 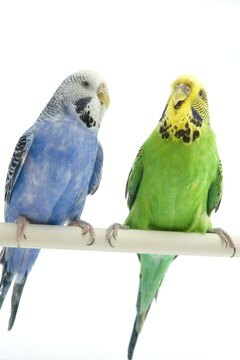 Budgies are social birds, and will become stressed if they aren't stimulated or allowed to interact with other birds or their people. You'll get the added bonus of watching two entertaining, playful and inquisitive birds play off of each other.